In addition to my work as a professional organizer, I also work part-time as a massage therapist. When I was training to be an organizer, one of my first practice assignments was to come up with ideas on how to organize our “space limited storage” closet. With all the sheets, bolsters, pillows, hot stones, a roaster, and oils etc., space can get pretty tight. Massage is a high “accessory” business. 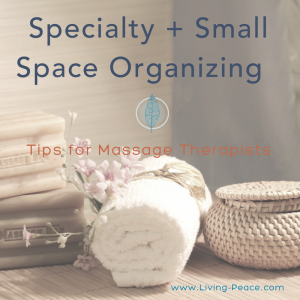 In organizing supplies for my home and mobile massage business, where I need to transport all of those things in addition to my table and stool, so being organized definitely helps me be more grounded when I am with my client. One of the ways we stay organized here in our office is that we have a big shelving unit with fabric bins, one bin for each of us. I keep my massage oil, lotion, candle, special oils and aromatherapy, nail file and clippers, hair ties, extra clothes, and client intake forms all in my bin. Every once in awhile I will clean it out and restock as necessary. We also utilize vertical space/shelving as much as possible to store linens, extra pillows, bolsters, and our pregnancy bolster system, as well as water, coffee, cups and napkins, hot stones, and cleaning supplies. 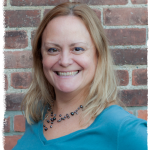 Each week I review my schedule for special massage setups such as hot stone or pregnancy and any specific client specialties so I can plan ahead. I also do some marketing. Don’t have a full schedule? Add extra time to increase my marketing. On extra busy days, I set breaks and ensure that I am keeping up with food and water. I keep handy, quick snacks stocked in my massage bag like nuts, dried fruit, granola bars or will pack some fresh fruit in case I can’t stop for a full meal. I also build time into my weekly schedule outside of massage and organizing for self-care, and that includes getting on the massage table to receive bodywork whenever I can! Are you a massage therapist? Share your thoughts and tips in the comments below. Not a massage therapist? Use these tips to set yourself up with your own little self-care spa space or get yourself a massage. You’ll be glad you did!